It's under 90 miles from our house to the ferry terminal, so in theory, we could do the whole round trip on one 240-mile "range mode" charge. James had just delivered our Roadster Foundry Mobile Connector (RFMC), so we had everything we needed to charge from a standard 110V household outlet, a dryer outlet (240V/30A) or an RV outlet (240V/40A). Just to be safe, as our charging opportunities were unproven, we wanted to make the most of our charge. 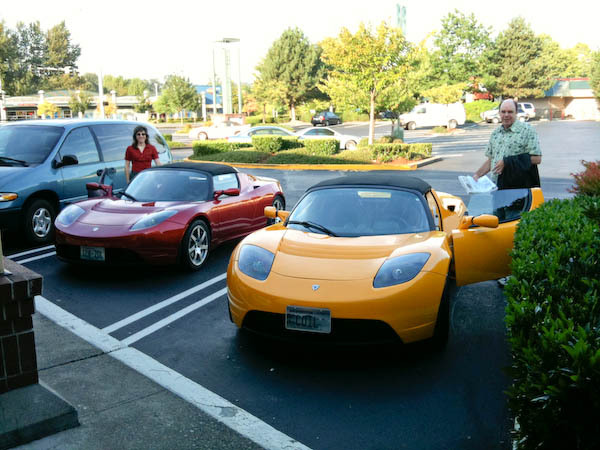 So, we met Dave at the Redmond Panera, planning to take surface roads up to Woodinville before jumping onto I-5. Here are Cathy and Dave as we're about to leave Redmond. On the freeway, we put on cruise control at 60 mph to drive as efficiently as possible. It went pretty well except for a couple of miles of torn up roadway. To get to the far left paved lane required driving over a vertical lip that looked huge from the cockpit of the Roadster, so we hung out until I couldn't stand it any more. Of course the torn up road ended within seconds of when I finally climbed up over the lip. We arrived at the ferry terminal with 60% of our charge remaining, which means we had more than enough charge remaining for the return trip even if we didn't charge at all on the island. More to the point, a little overnight charging from a standard 120V household outlet would be more than enough to make up for all of the driving we'd be likely to do on the island, so charging is definitely not an issue for this trip even without any 240V charging. Our two-Roadster caravan parked together in the ferry lane, which immediately attracted a crowd. We had a great time answering questions while we waited just over an hour for the ferry to start loading. 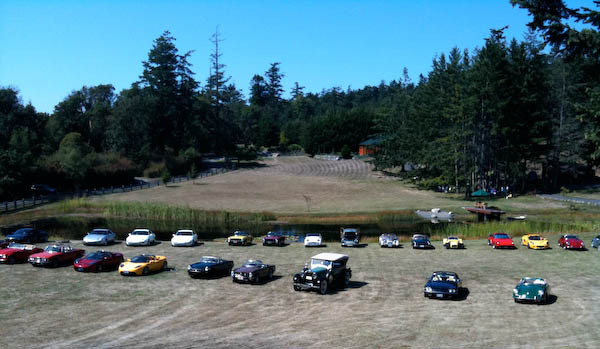 On Saturday, the day before the show, the car club arranged a picnic and island tour for the participants. Bob and Lissa McDowell hosted the gathering at their beautiful home. 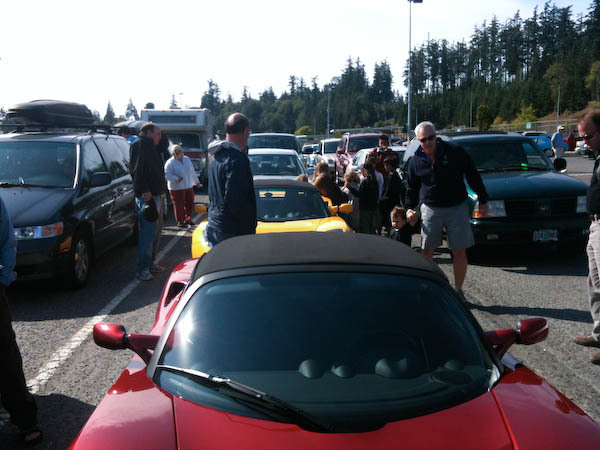 After the picnic, we joined 31 other sports cars for a 68-mile tour of the island. It was really quite a spectacle, the island sights for us and the string of cars for the passersby. Here's a photo of most of the cars that came for the picnic. We were staying with friends on the island, so we had the comforts of home. 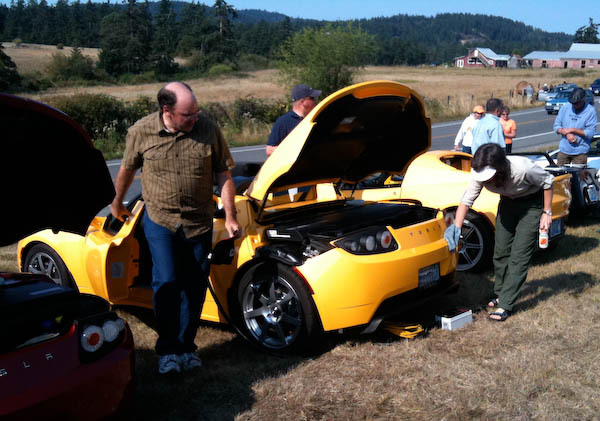 Dave was staying at a cabin on a dirt road, so his gorgeous yellow Roadster got coated in dust each night. So, on Saturday and Sunday morning, he joined us for a car washing party. Here are Tom and Dave working on the cars just before the show. Cathy is the detail person, so she was always at work when we were cleaning the cars, but happened to be behind the camera for this photo. Living up to her reputation, here's Cathy touching up Dave's car before he was even out of his car upon arrival at the show. We've been to a number of car shows now, and this one was by far the best organized. They not only had a plan, but they even managed to pull it off. (Yes, I'm scowling at you, Greenwood Auto Show.) They put us in a prime spot, front row next to the road, closest to the entrance, in a row with our cousins, the Lotus vehicles, including a DeLorean (which, like the Tesla, shares some heritage with Lotus). 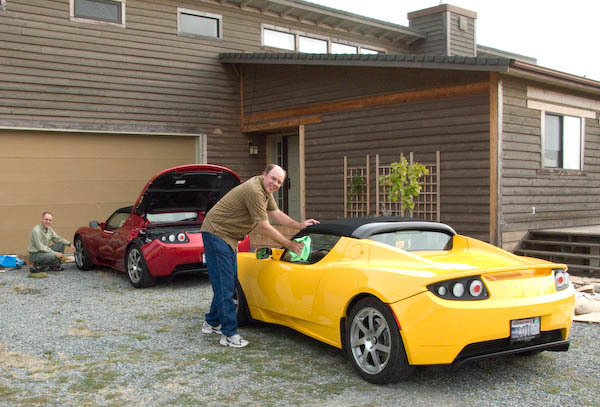 When we're at a show like this, there's always someone who wants to brag about their tenuous connection to Tesla, "my neighbor's brother-in-law's cousin works next door to Tesla." So, when a couple walked up a claimed that their "son made these cars" for about 1/10 of a second I did a mental eye-roll and thought, "yeah, right." I was just about to make the effort to be nice when I remembered that at the picnic, someone mentioned that Martin Eberhard's parents were expected to be at the show. Then my reaction changed to, "Wow! You must be Martin's parents!" They asked us what our VIN sequence numbers were, then asked our names, a very insider approach to meeting Tesla owners. When I told them my name, they said it sounded familiar. I suggested that perhaps Martin may have mentioned my name, as we have a bit more in common than Roadster ownership. We had a very nice chat with them about Martin, the Roadster, Martin's aftermarket mobile connector, the show, and the island. They mentioned working on getting Martin and his family to come visit, and we explained that Martin has a lot of fans in the area who would like to meet him and offer their Roadsters for a drive. In the photo below, from left to right, are Dave Denhart, Susan & Rainer Eberhard, Cathy & Tom Saxton. Shown behind our Roadster is the mobile connector designed by Martin Eberhard. We had a great time at the show talking to people about electric vehicles. As usual, many people were quite knowledgeable about the cars and excited to see one in person for the first time, some could even rattle off the stats as well as we do. 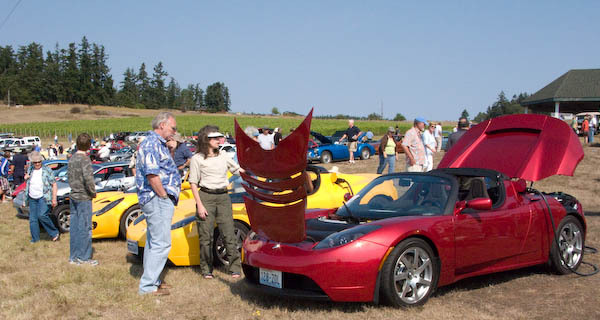 There were a few people who knew nothing about the cars and were very surprised to learn that a pure electric car could hold its own against comparable gas-burner sports cars. The show organizers were appreciative that we made the trip to show our cars and awarded us a plaque in recognition. 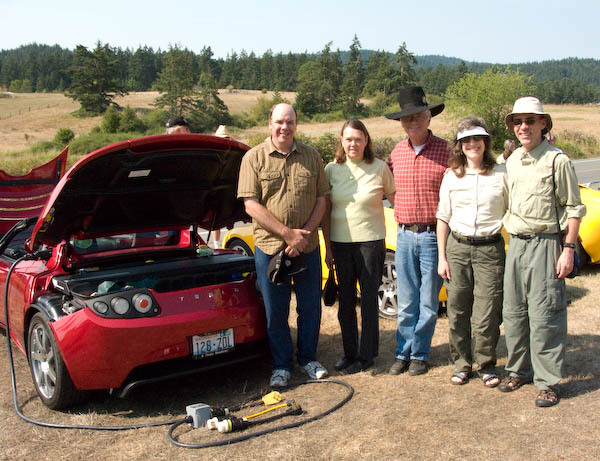 At the end of the show, the club president dropped by to personally thank us and told us we had changed many minds about the viability of electric vehicles. 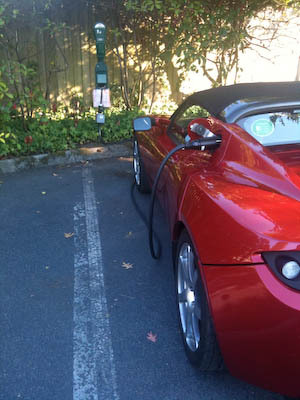 Dave found out about a number of possible charging locations around Friday Harbor. The one we ended up using was behind Key Bank where there's a non-descript parking meter that's really a 120V/240V EV charging station. It has both a NEMA 5-20 (compatible with a standard 120V household plug, but on a 20A circuit) and a NEMA 14-50 (240V on a 50A circuit). The parking meter implies you need to feed money in change to get charge, but it seems to be stuck in the on position. Using the RFMC, we were able to charge at 240V and 40A, topping off our standard mode charge with 17 kilowatt hours (kWh) in 2 hours, 23 minutes. 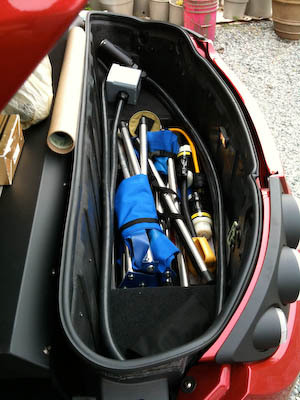 Early in the packing process for the trip home, here's the RFMC packed into the bottom of the trunk with a couple of camping stools. The trunk fully loaded, plus we had a bit more stuff behind the driver's seat. 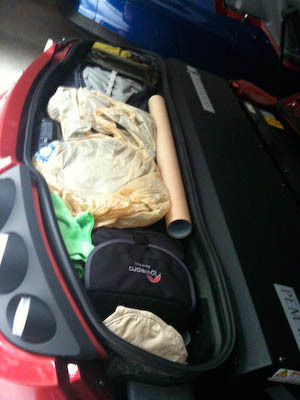 If you pack light, the Roadster has adequate luggage space for 2 people and 5 days in warm weather. There are three primary reasons to talk about energy efficiency for an electric vehicle: to understand the vehicle's range between charges, to understand the cost of electricity for driving an EV, and to compare it against driving a conventional gas-powered vehicle. The figures below really only relate to range on the Roadster, but I'll talk about the other two issues at the end. Measuring efficiency for an EV requires some new units. We can't use miles per gallon because we don't burn any gallons of gas. Instead, we choose to measure amount of energy used per mile, and a convenient energy unit for electricity is the Watt-hour, so we measure efficiency in Watt-hours per mile, abbreviated as Wh/mi. In these units, smaller numbers are better. The energy use reported below is energy taken from the battery pack and ignores energy lost in charging. "Ideal miles" is an estimate of the remaining charge in the battery pack based on a standard driving cycle. It's only an estimate because it's difficult to precisely measure the remaining charge in the pack, and the actual miles you'll get depend on the driving conditions (speed, slope, weather, cargo weight, etc.). On the trip from home to the ferry, we drove surface streets and highways as much as possible to shave off miles and lower our cruising speed before getting on the freeway, then driving on 60 mph cruise control. For that segment, the trip meter reported 242 Wh/mi, driving 86 actual miles and consuming 84 ideal miles worth of charge. That would extrapolate to a range of 253 miles if we drained the battery all the way to zero (which isn't good for battery life if done frequently; it's better to stay above 10% charge if you can). On the way back we started with a full standard mode charge, so we took the freeway as much as possible and drove 65-70 mph. For that segment, the trip meter reported 262 Wh/mi, driving 98 actual miles and consuming 115 ideal miles worth of charge. That would extrapolate to a range of 210 miles (if we had charged all the way up in range mode and drove it down to empty). For the entire trip, which included some spirited driving on the island and a few demo rides, the trip meter reported 257 Wh/mi on just over 300 total miles across several partial charge cycles. Regarding overall energy efficiency and cost of operation, we installed dedicated electric meters on the chargers for both of our EVs, so we can compare miles driven to total energy drawn from the grid. Since we pay about 9 cents per kWh for "green" power from Puget Sound Energy, driving with a clean conscience costs us three cents per mile, or about 33 miles per dollar of electricity. For gas at $3/gallon, this translates to a cost equivalent of driving a 99 mpg gas-burner. Not bad for a sports car that does 0-60 mph in about 4 seconds and the quarter mile in just under 13 seconds! We discuss the comparison to gas-burners with respect to carbon emissions on our EV Energy Efficiency page.